Like most nonprofit organizations, Legal Voice relies on the generosity and enthusiasm of our amazing volunteers. One way members of our community help advance our work is through our policy workgroups and committees, where volunteers give their time and expertise to advance the law, defend existing protections, and educate people in the Northwest about their rights. 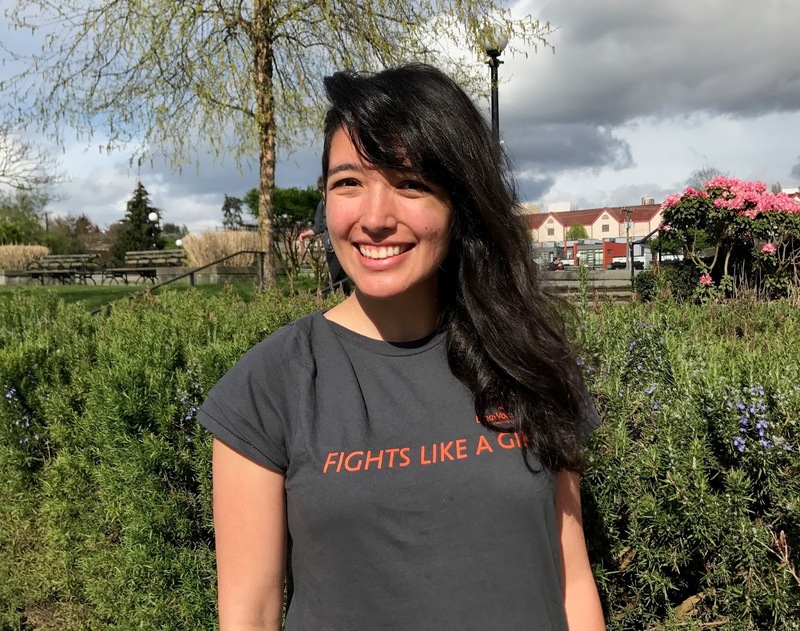 In observance of Sexual Assault Awareness Month, we asked a few questions of Olivia Ortiz from our Campus Sexual Assault Workgroup to learn more about the important work this group is doing. Read on! Legal Voice: Who makes up the Campus Sexual Assault Workgroup, and what is the group's goal? Olivia: The Campus Sexual Assault Workgroup is a diverse group of lawyers, students, advocates, and recent grads all working to one goal: empowering student survivors of sexual violence with knowledge of their rights. Sexual assault is devastating, and has a huge impact on access to education. When you're trying to balance school with just trying to survive, it is hard to know what to do, let alone figure out and research what long and confusing policy means. Survivors deserve an education and deserve justice, whatever that may mean to them, and we are here to help. Legal Voice: How is the workgroup working toward this goal? Olivia: Our group is creating an easy-to-access online Know Your Rights guide for students in each state of the Pacific Northwest to access in times of crisis. This guide breaks down state and federal laws in a way students can access and empower themselves in different scenarios following sexual assault. Whether that means preparing for a school hearing, going through the criminal process, or learning what accommodations are available for attending class, we've got you covered. We want this guide to be an intersectional one, including rights and concerns particular to undocumented students, LGBTQ students, disabled students, and students of color. We will release our Washington State guide soon, with guides for other Pacific Northwest states to come. Legal Voice: Can you tell us about your background and what led you to join this workgroup? Olivia: While I was in college, I noticed my university had sexual assault policies that were difficult to understand and that were not being enforced in the letter nor spirit of Title IX. I decided to take action and create a survivor advocacy group on campus. One of our very first projects was to create a similar resource guide for students on our campus, and we eventually pushed our administration to create a more streamlined process with an easy-to-understand website to go with it. When I heard that Legal Voice was doing a similar project for students in each state of the Pacific Northwest, I was excited to find another, similar way to continue my efforts after graduation. I am passionate about empowering survivors to achieve justice, and I firmly believe that being able to attend and fully participate in school can be one of those ways. Legal Voice: Why do you think it is so hard to turn the tide on campus sexual assault? Olivia: Sexual assault is a huge barrier to getting an education, and all students deserve to go to school where they can learn free from sexual violence. If a student survives sexual assault, schools must do their job to make sure that the survivor is still able to fully participate in classes, student jobs, extracurricular activities, and any other school-sponsored event. Much of the difficulty in turning the tide is the unwillingness to listen to what survivors need to feel able to access their education and then act upon it. Whether that be congresspeople introducing misguided bills forcing schools to report to the police, or schools not honoring survivors requests for accommodations or inclusion in influencing campus policy, survivors are often left unheard. In order to change our culture, we must meaningfully listen to survivors and ensure they are leading these efforts. Legal Voice: April is Sexual Assault Awareness Month. In your opinion, what are some of the biggest misconceptions about sexual assault? Olivia: Two of the greatest myths that I've encountered is that sexual assault doesn't happen at one's institution and that it does not happen frequently. Sexual assault affects people of all identities and particularly the most marginalized. Sexual assault happens at large institutions and small institutions, for-profit and non-profit, religious and non-denominational, and public and private. Although it is convenient to brush these things aside, we must accept this reality in order to change it. Legal Voice: How can students help get the word out about the upcoming Know Your Rights guide? Olivia: Our guide is a living document for students, and thus is very much open to student and survivor feedback. We want this guide to be a tool for students and it is really important that we tailor our guide for their interests and needs. And, of course, we could use student help publicizing the guide. We would love for students to bring us to their campus to discuss the guide, or have students reach out to their campus wellness centers or other important partners to distribute our guides. If you are interested in bringing the Legal Voice Campus Sexual Assault Workgroup to your school or have ideas on how you can help promote the Know Your Rights guide, please contact us!